Encourage your child's curiosity through fun, hands-on activities, and exhibits that introduce children to science, technology, math, and engineering! Please note: This program is temporarily unavailable as Port Discovery builds bigger, bolder, and better new exhibits. Join us for play and learning in The Construction Zone in the Atrium at Port Discovery sponsored by M&T Bank and at Port Discovery's Pop-Up Play Space in the shops at Kenilworth while construction is underway. Visit www.PortDiscovery.org/Construction for more information. Juggle, balance a feather, spin a lasso - and learn how science makes these fun tricks work! Enjoy our interactive Circus Science program, held select Saturdays throughout the year, and learn science concepts as you watch and try out super cool, super silly demonstrations! Check our Event Calendar for upcoming Circus Science programs. 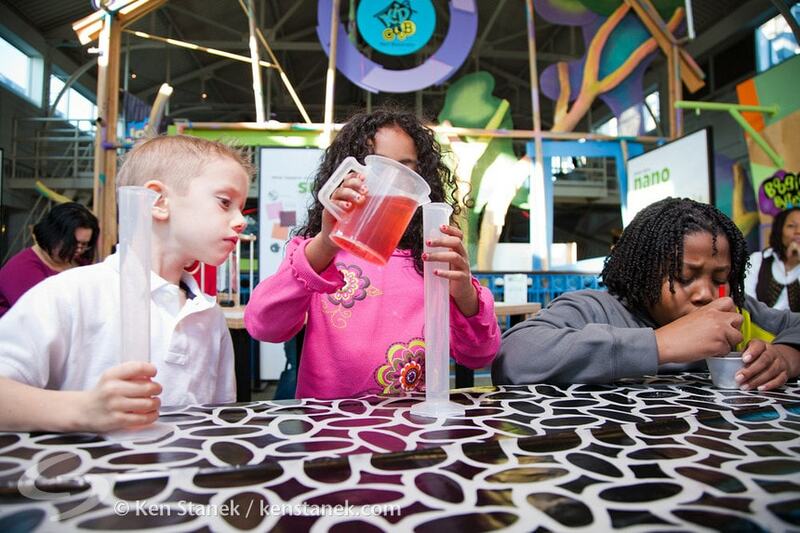 Explore STEM through a hands-on activity or experiment at our STEM Stations! These pop-up activities often happen on Fridays and Saturdays throughout the year and feature simple STEM activities that encourage curiosity, creative thinking and exploration. Check our event calendar for upcoming dates and times STEM Stations will be offered at Port Discovery! Please note: This event is temporarily unavailable as Port Discovery builds bigger, bolder, and better new exhibits. Join us for play and learning in The Construction Zone in the Atrium at Port Discovery sponsored by M&T Bank and at Port Discovery's Pop-Up Play Space in the shops at Kenilworth while construction is underway. Visit www.PortDiscovery.org/Construction for more information. Get ready for a day full of fun science while learning about your favorite circus tricks under Port Discovery’s Big Top! Clown around at interactive Circus Circuit Stations! Learn the tricks of the trade such as juggling, balancing feathers, and much more! Stop by art tables to make-and-take a sound sandwich that you will use during a fun Circus Parade. Plus, hop in the backseat of the Circus Train Ride before the day is over and enjoy the view! Check our event calendar for upcoming Circus Science events! STEM in Spring - Details Coming Soon! Join us every day over Spring Break for fun, hands-on, STEM-themed programs that teach through play! Enjoy special performances along with special science exhibitions, projects, and learning each day of the week! Make a splash in this new wet and wonderful area of Port Discovery! WOW!, helps children understand human interactions with water in fun, exciting and interactive ways. Featuring: Earth Today (a real-time atmospheric display created by Animated Earth LLC featuring global data from NASA, NOAA and USGS), Water Chimes, Build a Fountain, Plumbers Park, Stream Table, Bubble Hoop and more! Note: You will get wet in WOW!, but it's OK, there are slickers and crocs for everyone. You may want to bring a change of dry clothes. Field Trips - Now Booking for Spring 2019 and Beyond! Hands-on learning and adventures at Port Discovery can be enhanced through the many educational, interactive and fun programs offered at the Museum. Choose from guided programs focusing on Arts & Culture, STEM, Healthy Families: Healthy Communities, Early Education and more – and help children get hands-on with the topics they’re learning about in the classroom! Or, schedule a self-guided adventure at the Museum. Group Visits are available for groups of 15 or more, are available throughout the year, and feature highly discounted priced tickets. LEARN MORE ABOUT FIELD TRIPS AT PORT DISCOVERY! Our Museum on the Road program brings unique, hands-on art, music, STEM, and early literacy programs for Pre-Kindergarten through 5th grade students right to your classroom! Programs can be booked individually or as a series, and we offer interactive assembly programs, too! All programs support Common Core and Next Generation Science Standards. Looking for ways to provide new experiences, fresh exhibits and unique programs to your visitors without breaking the bank? Engage and entertain visitors with fresh, educational, and FUN interactive exhibits from Port Discovery Children’s Museum, one of the area’s leaders in informal learning and purposeful play! Through Port Discovery's Museum on the Move program, you can rent a variety of unique mini-exhibitions that engage family audiences in playful learning about science, space, agriculture and other topics. Port Discovery Children’s Museum student visits and programs are supported in part by the Maryland State Department of Education. Programs and exhibits at Port Discovery are made possible in part by the Citizens of Baltimore County and by the Howard County Arts Council through a grant from Howard County Government.